There are dozens of books that will help provide some background to the things discussed on this site. We've taken this opportunity to provide you with a few suggestions. Many of our members are familiar with this material and you'll find the topics discussed in these books often serves as a sub-text for some of the deeper discussions on the site. Initially, the site was owned & operated by Roger K. Young (author of several of the books listed below). We highly recommend anyone and everyone read his books (the suggested order is layed out below). Strongly recommended for all new members of the site. 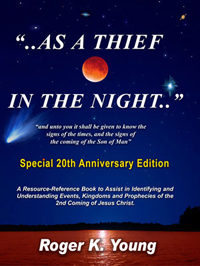 As a Thief in the Night" has quietly become one of the top sellers among LDS religious works and is quickly on its way to becoming an LDS Reference Library mainstay, having sold out 8 printings in just six years. 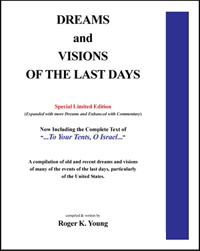 Not only is it an outstanding reference book on the last days with over 500 verified LDS references on the Second Coming of Jesus Christ, but it is a "good reading book" and leaves you spiritually uplifted even though it describes in some detail the troublesome times that lie ahead. the last years leading up to the Second Coming of Jesus Christ. PURPOSE of Dreams and Visions (from Roger) The purpose and intent of this book is actually very simple. It is to perhaps convince a few more people to follow the living Prophet a little more closely, and to prepare themselves and their families for the events which lie in the (near?) future by preparing Spiritually (getting temple recommends and using them often), Physically (obtain a minimum one year supply of food, clothing, shelter and other necessities), and Mentally. And as part of this preparation to perhaps come to understand some of the events that they will likely have to pass through. Elder Oaks recently in the April 2004 General Conference encouraged all members of the Church throughout the world to "accelerate our own preparation and try to influence the preparation of those around us." WE HAVE BEEN TOLD REPEATEDLY by Prophets and Apostles for over 100 years to prepare for sudden and often unexpected calamities that will happen many years before the actual return of the Savior. They have warned us about an approaching and sudden famine in America that will last at least a full year, accompanied by a sudden dissolution of society and government, as we currently know it. In the scriptures, three wars are described during the last days (the 3 great Woes): a strange small 5 month war, a devastating 13 month world war, (which is particularly severe in America and the other Gentile nations) and the final 3 year Armageddon war in Israel that precede the actual 2nd Coming of the Savior. Is it actually possible to know MORE about what may be coming in the near future? Perhaps together we can add a few more details about some of the surrounding events that lead up to this prophesied time of chaos and darkness. Such knowledge would certainly help us to better prepare for what is coming, and perhaps even give us some real insight into the very nature of what is coming. President Hinckley, in 2001 General Conference, quoted Joel's prophecy saying it had been fulfilled: "And it shall come to pass afterward, that I will pour out my spirit upon all flesh; and your sons and your daughters shall prophesy, your old men shall dream dreams, your young men shall see visions: And also upon the servants and upon the handmaids in those days will I pour out my spirit. And I will shew wonders in the heavens and in the earth, blood, and fire, and pillars of smoke." 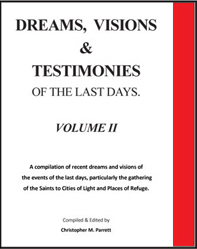 In this book, LDS author Christopher M. Parrett (The LDS Preparedness Manual) presses forward with the ground breaking work laid down by Roger K. Young in his original book (Dreams & Visions) by assembling even more of the dreams and visions the Saints are currently having, and have had over the last several years, that continue to confirm the words of the Prophets and Apostles. Children, teenagers, mothers and fathers are experiencing the prophesied gifts of Joel on a daily basis. Most concern themselves with what events are coming in the very near future and have already started to unfold. We invite you to review what many of your friends, neighbors and fellow Saints are seeing as possible fulfillment of Joel's prophecy to compare them with what Prophets and Apostles have already described, and see if there is anything of importance for you and your family. 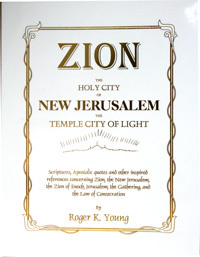 Scriptures, Apostolic quotes and other inspired references concerning Zion, the New Jerusalem, the Zion of Enoch, Jerusalem, the Gathering and the Law of Consecration. The near future events leading up to the 2nd coming of Jesus Christ with particular emphasis on the 13 Month World War, Judgements, Plagues and the Great Scourge. (With sections on the judgements and scourges of the Rocky Mountain / Utah area, the Refuges of Safety, and the Lord's prescribed antidote for the plagues, diseases and scourges.) 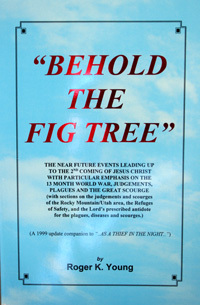 Behold the Fig Tree was one in the series of books written by best selling LDS author Roger K. Young. His books on the events of the last says, starting with "As a Thief In The Night", have skyrocketed since their introduction to become the #1 selling LDS books on the last days throughout the world and have become a mainstay in LDS libraries everywhere. In "Behold the Fig Tree" brother Young goes into more detail about some of the more terrible events/plagues that will affect the United States, the Rocky Mountains and Utah. He also details the Lord's own prescription on the preventative antidote that will protect those who follow it from the diseases of the last days and specifically from the great scourge/disease that will sweep the world. • Why are terrible things allowed to happen to good people? • Is there a purpose to life here on earth? • Why is it important to treat others with respect? • Is it important to be good? • Is there such a things as deja vu? • Is there such a thing as reincarnation? • What are some of the difficulties that may lie ahead for us on earth? Sarah was also shown several future events. She saw tall buildings in New York collapsing amidst smoke and debris and people running years before 9/11. This was the beginning of other calamities which were to include a great plague suddenly striking several cities in the United States, a nuclear war and other devastating events. This happened to her because Sarah, after a lifetime of abuse, difficulty and disappointment, had sought oblivion and death by attempting suicide. She found that it is always wrong to take one's own life, as it frustrates the purposes of life and brings on difficulty and penalty in the world beyond. However, she learned that there are different degrees of seriousness of such actions. She emerged from her experiences with a changed heart, released from the pain and bitterness of abuse and failure and willing to forgive herself and others, something that had completely escaped her before her experience. "When the paramedics pronounced me dead at the scene of my 'successful' suicide, I had sought oblivion and darkness. Because of my horrific experiences in life, I knew that there was no God and therefore, no afterlife. And so, when I suddenly found myself watching the police and the paramedics work on my body from somewhere near the ceiling, I learned that I had been quite wrong..."
So begins the story of Sarah's extraordinary experience. It is without a doubt the most complete and extensive NDE ever recorded. Sarah not only visited the beautiful spirit world, describing the people living there, their dress, activities and buildings; but she visited what we call "hell" and describes the torment of those committed to that terrible place. She saw many things and received answers to many questions. Sarah was also shown many future events which would shortly happen upon the earth. One of the things she saw, which was to signal the beginning of those events, was some tall buildings in New York collapsing amidst smoke and dust and people running. She also saw a great plague suddenly strike four cities in the U.S., the start of a nuclear war, and many other things. Prophetic Statements on Food Storage for Latter-day Saints has one promise when it comes to food storage, peace of mind and how to earn it. 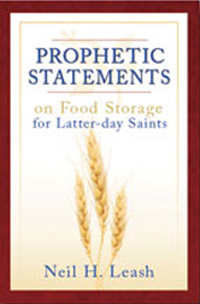 Author Neil H. Leash has drawn together the messages of LDS General Authorities given to the Saints concerning the essential need for food storage in preparation for tribulations. He focuses on "crystallizing moments", sudden events that radically changed mankind's actions and directions during the past century and shows that similar events can be expected in the future. "The degree of our preparation will equal the extent of our obedience, which will determine the measure of our peace of mind," writes the author. He shows that prophetic warnings and promises, both past and current, clearly show that many Saints are not prepared for emergencies. peace of mind you've been seeking. This manual has been prepared for, and is intended to be read primarily by, the active members of The Church of Jesus Christ of Latter Day Saints. Please Note: The contents of this booklet are intended to assist individuals and families in coping with emergency preparations. However, final decisions on preparation for actions taken during an emergency are the sole responsibility of individuals. No one knows your needs or can take care of you better than you can-nor does anyone else have that responsibility. Information and examples contained within this booklet are provided for illustration and advice only. Therefore, no liability is assumed by the Editor or any of the Authors for the use or misuse of any information or products contained in this publication. This publication has not been endorsed or produced by The Church of Jesus Christ of Latter Day Saints, and its contents and the opinions it expresses are those of the Editor and the separate authors. to ensure that all materials are in accordance with general church guidelines on food storage and family preparedness. 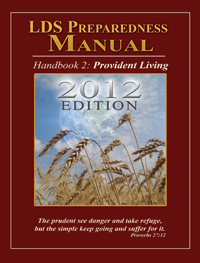 An electronic PDF version of this manual is available to download HERE. This printed version has been made in response to the many requests we have had from members that do not want to print out such a large amount of information. This manual has not been priced to generate a profit as the majority of the contents ARE copyrighted by the various authors, but is intended to cover the actual costs of printing and shipping. The high cost is a direct result of only printing only 100 copies at a time. If demand proves high enough we will print the manual in larger quantities and lower the retail price accordingly. A fast-paced novel that follows a group of Christian survivalists through a stock market crash, an economic collapse, and a second civil war. It is packed with useful information on how to survive a disaster. Could you survive a total collapse of civilization? Would you be prepared for the economic collapse, the looting, riots, panic, and complete breakdown of our infrastructure? An intensely powerful novel of the turbulent near future. 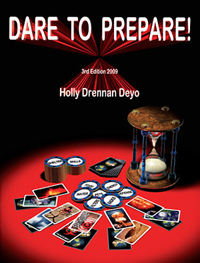 The author says, "I made the scenario in the novel a near "worst case" ( of the monetary system collapse) in order to make it more interesting reading, and as an opportunity to show the need for planning and preparedness in a variety of areas (first aid, food storage, faith, self-defense, communications, etc.)" 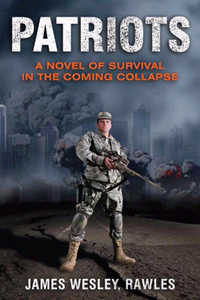 Patriots: Surviving the Coming Collapse is an intriguing, fast-paced, suspenseful, well-written novel. The setting is now, or in the very near future, about a group of survivalists originally from Chicago, who flee to their safe place in Northern Idaho. The group started about nine years prior to the main timeline, having met while most were in college. The members of the group felt as if something major was going to happen in the future, and they wanted to be ready for "it." They didn't know at the time what was going to trigger the event; whether it would be a nuclear or biological attack, or something elseso they prepared for several possible scenarios. The event, called in the novel "The Crunch," is a worldwide economic crash that soon takes the country into a TEOTWAWKI (the end of the world as we know it) scenario, like some people felt might happen with the turn of the century computer problem (y2k). The Crunch starts with runaway inflation, the government trying to respond by printing more money, a full blown worldwide socio-economic collapse, anarchy, a foreign invasion of the United States of America and a second Civil War to re-establish true freedom and democracy in the USA. The story is about how this group copes with the collapse. It covers how they planned for the event; skills they learned, things they did, and products they acquired to prepare for the event. Throughout the story lots of practical ideas are written into the plot. And to my surprise, several real people and companies were used in the story line. It even solved my problem of where to purchase an item I've been seeking. But this is more than just a novel, its a gold mine of information. Rawles doesn't just tell you WHAT could or would happen, he explains exactly HOW TO PREPARE FOR IT. It is packed with useful information on how to survive a disaster. The main character is Todd Gray, an accountant from Chicago in his early 30s. He is a conservative Christian survivalist and the leader of an eight-member retreat group, a group of like-minded survivalists. Two years before the onset of a stock market crash and socioeconomic collapse, Todd and his wife Mary buy a farm in rural north-central Idaho. The Crunch occurs. Mass inflation and a stock market crash are followed by absolute chaos in the cities and suburbs. There is widespread, continuous looting and arson that cause massive loss of life and property. The federal and state governments essentially disappear En route to the retreat, group members encounter many dangerous situations. Their many adventures are detailed. A chilling novel because reality is just around the corner. 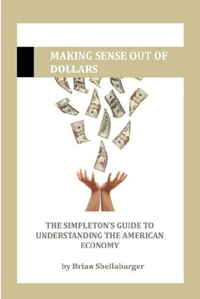 Making Sense Out of Dollars is designed to help the average American understand the basic principles of economics that make this country work. Most people don't have the patience or the time to sit through the complex theoretical textbook approach that's traditionally used to teach economics. Topics covered include the stock market, inflation, the U.S. Dollar, the national debt, the federal reserve, and more. Even if you think you already know these concepts, you'll find additional insights by reading these pages. The book can be read and understood in an evening and uses a combination of basic diagrams and real-world, simplistic examples to help make complex topics easy to understand. Students, parents, and anyone else with a desire to understand the impact of the evening headlines will benefit from this book. NOTE: This book is provided as a FREE DOWNLOAD to all AVOW members! 61 chapters are dedicated to step-by-step preparation in simple English, much of which you will find nowhere else, as well as personal anecdotes. Dare To Prepare is not just a compilation of lists; it is the blueprint for how Holly and Stan Deyo organize their home. All the information you need to store provisions long and short-term is included besides detailed instructions of long-forgotten skills that's fun for the entire family. Lot of options are given to make your planning as flexible and personalized as possible. Dare To Prepare empowers you to store confidently for as little or as long as you like using both metric and US measurements throughout. 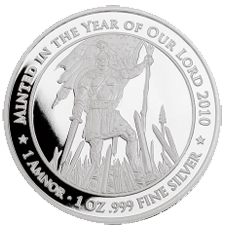 Captain Moroni Silver Coin 1oz Pure Silver (.999) - ? and minted for, the members of the LDS AVOW online preparedness forums. SURFACE of the coin. It appears to be matted, but in reality is NOT.